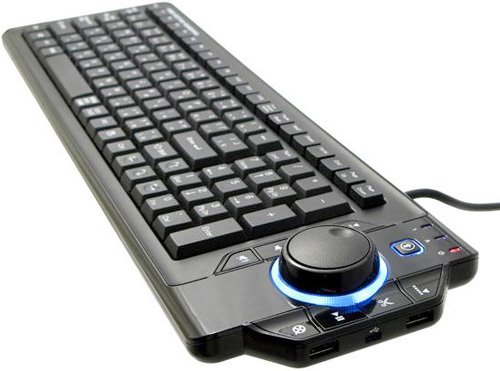 CodeAct Greditor Pro GR100 Video Editing Keyboard | OhGizmo! Technically any keyboard can be used for video editing if you’re handy with shortcuts, but the Greditor GR100 from CodeAct makes it slightly easier with a built-in jog/shuttle wheel and dedicated editing buttons to the right of the numeric keypad. The additional controls are compatible with popular video editing software like Adobe’s Premiere, and in theory since it can be configured via software, you should be able to use them with any app you choose. Just keep in mind that since it’s from a Korean manufacturer there could be a language barrier with the configuration software. ~$270 from Geek Stuff 4 U.
nice idea, but not Mac compatible and not left-hander usable. That keyboard is pretty slick. I like the style and layout.